Xiaomi, one of the biggest Chinese smartphone manufacturers, is expected to launch their next mid-range smartphone Xiaomi Mi Max 3. It is expected to have a bezel-less display catching up with the today’s trends. There were rumours about Xiaomi launching the Mi Max 3 with a massive 7-inch display. But the rumours are now not only the rumours as the specifications have been leaked online. The specification sheet of Xiaomi Mi Max 3 has appeared on China’s micro-blogging platform Weibo. The leaked specification sheet confirmed that the smartphone will feature a 6.99-inch full-screen display with 18:9 aspect ratio. 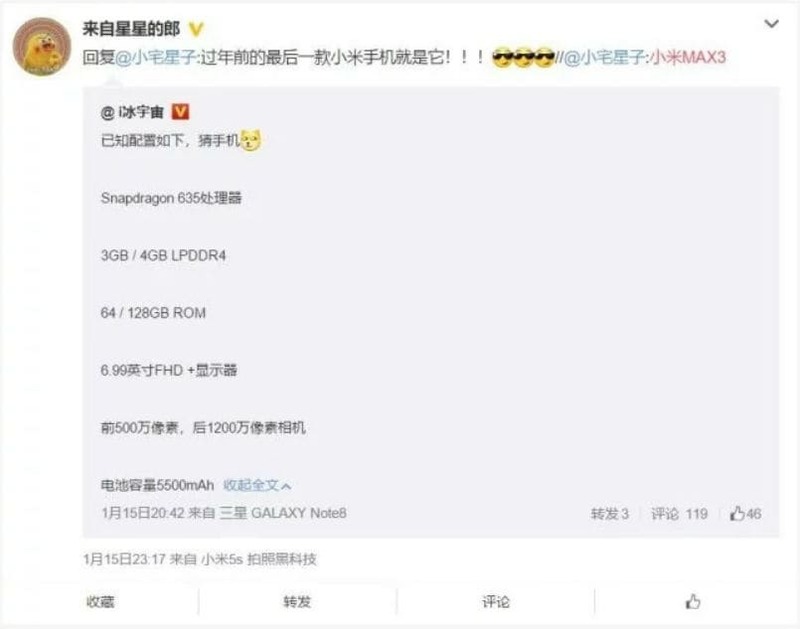 The post was first spotted by GizmoChina shows that Xiaomi Mi Max 3 will be offered in two storage options. The 3GB RAM with 64GB storage and the 4GB RAM with 128GB internal storage. Previously, rumours suggested that the smartphone will use the Qualcomm Snapdragon 660 octa-core SoC, the specification sheet posted on Weibo suggests it will use a Snapdragon 635 chipset. The Snapdragon 835 is still not launched and will be the successor of the Snapdragon 625. There are rumours of about 20 percent improvement in graphics performance with new Adreno GPU in the Snapdragon 635. Qualcomm still hasn’t unveiled its plans to update Snapdragon 625 mobile platform but it is expected to be based on the latest 14nm FinFET fabrication process. On the optics front, there might be a 12-megapixel rear camera and a 5-megapixel front camera. There were rumours of the dual rear camera setup but the leaked spec sheet contradicts that. The leak also suggests that Mi Max 3 will support Qualcomm Quick Charge 3.0 for fast charging. It will also be running MIUI 9 based on Android 7.0 Nougat. The smartphone is expected to be launched somewhere in June this year and could retail at a starting price of 1,699 Yuan (approximately Rs 17,000). Is the Asus Zenfone 4 here?